Laparoscopic Inguinal Hernia Repair: a Retrospective Study Based on the 17-year Experience of a Single Surgeon. This purpose of this study was to determine the safety and success rate of laparoscopic inguinal herniorrhaphy. 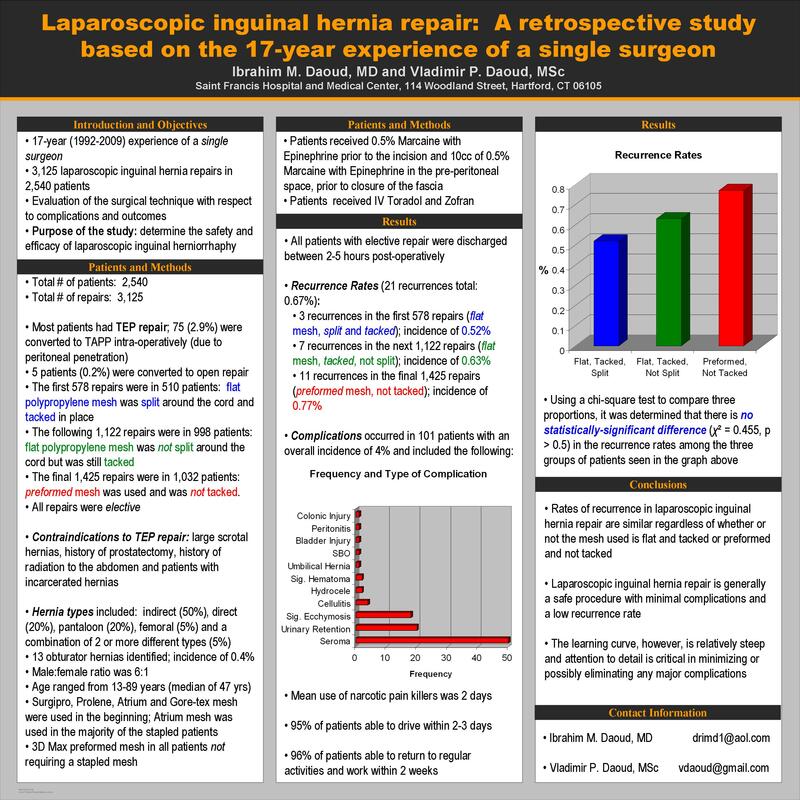 This is a retrospective study reviewing the experience of one surgeon during a 17-year period between 1992 and 2009, where 3,125 laparoscopic inguinal hernia repairs were done in 2,540 patients. All patients had TEP repair and a total of 75 (2.9%) of the TEP repairs were converted to TAPP repair intra-operatively due to peritoneal penetration. A total of 5 patients (0.2%) were converted to open repair. The first 578 repairs were done in 510 patients and the mesh used was flat polypropylene that was split around the cord and tacked in place. The following 1,122 repairs were done on 998 patients where the flat polypropylene mesh was not split around the cord but was still tacked. In the final 1,425 repairs, the preformed mesh was used and was not tacked. All of the repairs were elective. Surgipro, Prolene, Atrium and Gore-tex mesh were used in the beginning and then Atrium mesh was used in the majority of the stapled patients. In the patients that did not require a stapled mesh, only 3D Max preformed mesh was used. All patients with elective repair were discharged between 2-5 hours post-operatively. There were a total of 21 recurrences. Of those 21 recurrences, 3 were in the first 578 repairs (0.52%) in 510 different patients (0.59%) where the flat polypropylene mesh was both split around the cord and tacked. There were 7 recurrences in the next 1,122 repairs (0.63%) in 998 patients (0.7%) where the flat polypropylene mesh was not split around the cord but was still tacked. There were 11 recurrences in the final 1,425 repairs (0.77%) in 1,032 patients (1%). There were no deaths; however, there were several complications in 101 patients with an overall incidence of 4%. The complications observed include the following: seroma (50), urine retention requiring catheterization (20), significant ecchymosis (18), cellulites (4), hydrocele (2), significant hematoma (2), umbilical hernia status post TAPP repair (1), small bowel obstruction (1), bladder injury (1), peritonitis (1), and injury to the colon (1). Of the 21 recurrences, 15 were of the slider type, 13 of which were on the left side. Four recurrences were indirect and 2 were direct. All recurrences were repaired using the TAPP method. One hernia recurred post-TAPP repair and was repaired again using an open technique (plug and patch). The mean duration of use of narcotic pain killers in the post-operative period was 2 days. Most patients were able to drive within 2-3 days (95%) and 96% of patients were able to return to regular activities and work within 2 weeks. In conclusion, laparoscopic inguinal hernia repair is generally a safe procedure with minimal complications and a low recurrence rate. However, the learning curve is relatively high and attention to all the details is critical in minimizing or possibly eliminating any major complications.